What is Humidipak and How Does it Work? 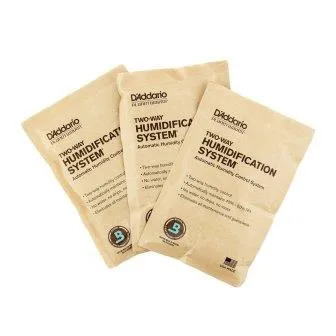 If you’ve recently started playing guitar, purchased a new guitar or moved to a different location with different humidity, then you might have heard of humidipak and wondered what is. This post will outline what humidipak is, how it works and how to use it. In actual fact Humidipak is the old branding for a product which is now called Two Way Humidification System. You may still be able to find some of the old humidipak product but mostly It will be called “Two Way Humidification System”. Whatever you call it – it is a product marketed by Planet Waves (a subsidiary of D’Addario). 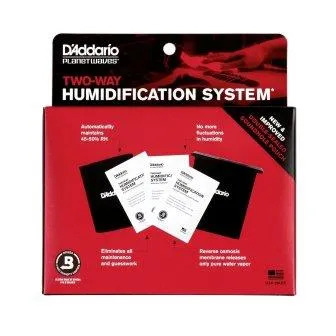 So you will see the product labelled as “D’Addario Planet Waves Two Way Humidification System”. They use the technology from a company called Boveda that make humidity control systems for a number of different applications, including musical instruments. Anyway, the point of the product is to keep your guitar at the right level of humidity so that the wood does not become too dry or too wet. It’s a two way system because it works whether you are in an environment where the humidity is too high or too low. O.k. so let’s get onto how it works. So, if you read the article at the link above, then you’ll know that the ideal humidity level for storing your guitar is between 45% and 55%. The Two Way Humidification System claims to keep your guitar between 45% and 50% humidity – regardless of the relative humidity in the area that you store your guitar. It does this by absorbing moisture whenever the humidity is too high (too wet) and emitting moisture whenever humidity is too low (too dry). O.k. so you can’t just stick the humidipaks on your guitar and then sit it on your stand in your room. You need to put your guitar in a case (preferably a hard case with a good seal) and then you place two pouches in the case with your guitar. These pouches hold the humidipaks. There is a soundhole pouch and a headstock pouch. 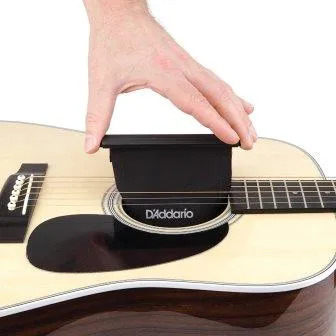 Place two humidipaks inside the soundhole pouch and then place that pouch inside the sound hole of your guitar by hanging it on the D and G strings. Place one humidipak in the headstock pouch and lay that pouch under the headstock (just lying on the floor of the case, directly under where the headstock sits. Do I Need to Replace the Humidipaks? Unfortunately they don’t last forever, so you will need to replace them from time to time or they will stop being effective. You keep the pouches though – you just need to replace the humidipaks inside the pouches. You can get refills of the humidipaks after you’ve purchased the initial system that comes with packs and pouches. How Often Do I Need to Replace the Humidipaks? On their website it says they should last between 2 to 6 months. If you live in a particularly dry or a particularly humid location, then your humidipaks will have to work harder to maintain a 45% to 50% humidity. For example if you are in a location that often has humidity levels well above 60% then the humidipak will have to absorb a lot of moisture to keep the guitar at 45% to 50% and if you live in a location where the humidity is regularly less than 40% humidity then the humidipak will have to emit a lot of moisture to prevent the guitar from drying out. The closer the normal humidity levels in your area are to 45% to 50%, less work that the humidipaks will have to do and will therefore last longer. Different seasons often come with different levels of humidity. So you might find that your humidipaks last longer, or use up more quickly, in different seasons. If you don’t have a great seal on your guitar case then the humidipak has to work harder because it has to deal with more of the environment’s humidity. In a well sealed case the humidipaks have an easier to control environment and environmental factors won’t have as much influence. So if you have a good seal, the humidipaks will last longer and if you have a poor seal they won’t last as long. If you have a guitar that hasn’t been looked after and has been exposed to high or low humidity then the wood could be particularly dry or particularly wet. If this is the case, then the humidipak will be used up much more quickly. In this case they may not even last the 2 months (but you’ll be restoring your guitar’s wood to much better health). Once your guitar’s wood has returned to the proper moisture levels then the humidipaks will start to last longer). I hope you now know what Humidipak is (The Two Way Humidification System), how it works, how to use it and how long the humidipaks last. Do you think you would use this system to keep your guitar in the proper humidity? I knew about the humidity for a guitar, “typically room temperature indoors would do the trick” but had no idea there was something out there for it when it’s not in ideal humidity. Since I live in Texas, the humidity here is atrocious, and on long road trips I would have it in my car and hope the seal on the case would keep it good until we got there, but now I have to get some of these.! I kinda feel stupid for never looking into it until I researched how they work, thanks for clarifying! Such a simple idea but surprised I didn’t think there was anything really out there, I mean I’ve heard of it but never really knew what they were or how effective they were, well until now, lol! Yeah, definitely good for a long car trip even when your guitar usually lives in a humidity controlled environment. Thanks for bringing that up – forgot to mention it in the post.